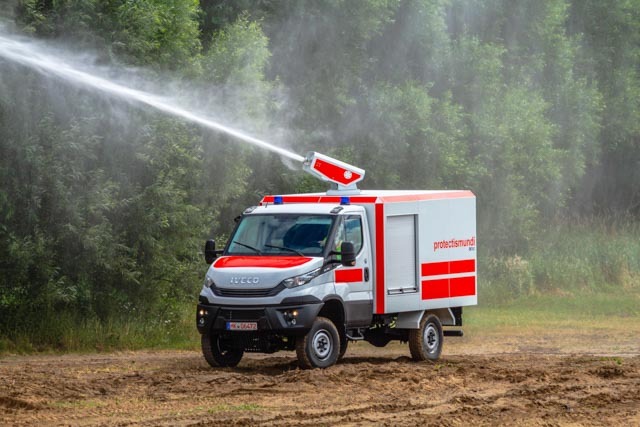 A new IVECO 4×4 First Responder races across the terrain of the Bundeswehr training ground, equipped with the latest high-tech fire extinguishing technologies built by SK-Tec in collaboration with protectismundi. 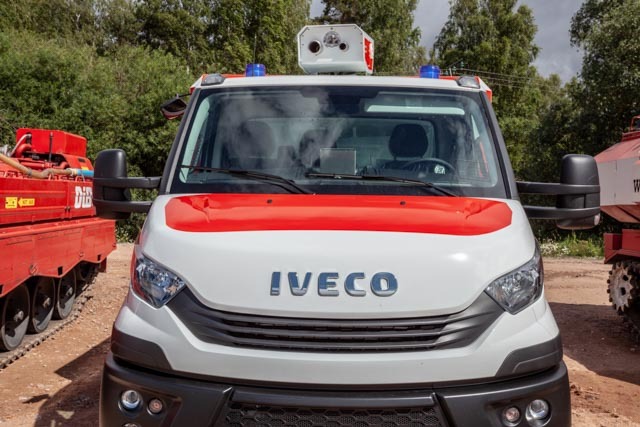 Its compact dimensions and powerful 4-wheel drive enable it to reach difficult trouble spots well before the heavy extinguishing equipment arrives. 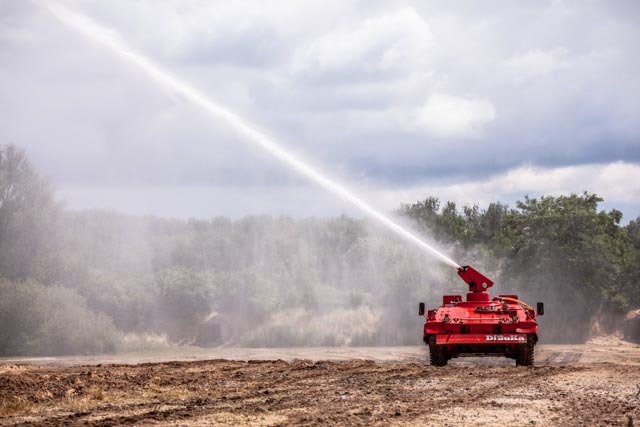 At the deployment site, the advantages of the First Responder for fighting forest fires are on full display. 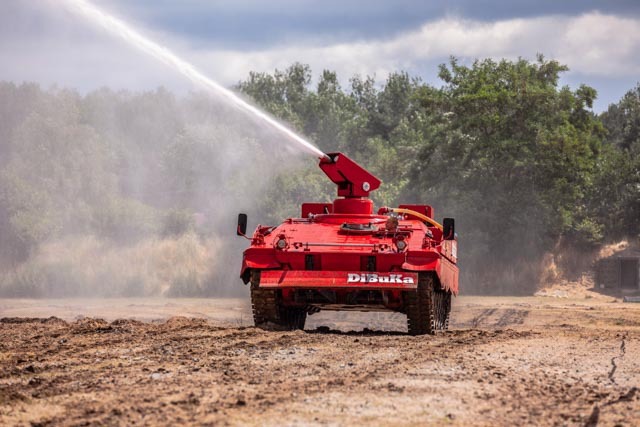 A 3000 liter water tank, powerful 200 bar water pressure and the patented high-pressure vortex extinguishing technology from protectismundi ensure a water trajectory of more than 80 meters and longer spray time for impressive performance fighting fires. 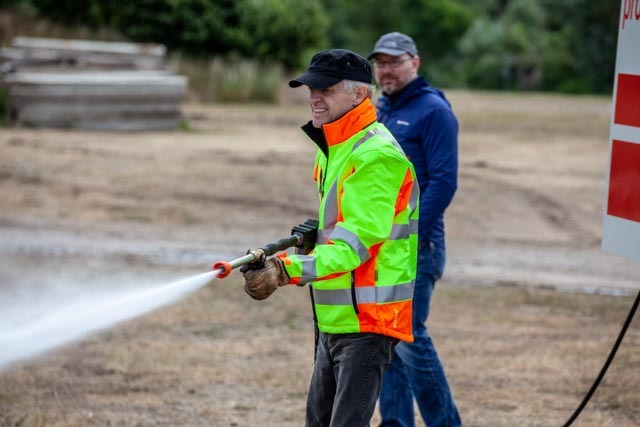 The superior performance of the extinguishing technology from Solingen draws great attention from the technical specialists who have come to the exercise from around the world. 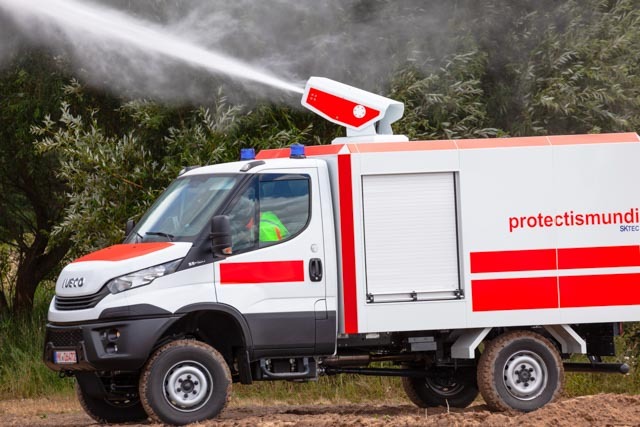 Seven fire companies from the Prignitz region, district emergency services and the Technical Relief Service (THW) demonstrated technical innovations and new firefighting strategies during the forest fire demonstration in Havelberg in the German state of Saxony-Anhalt. 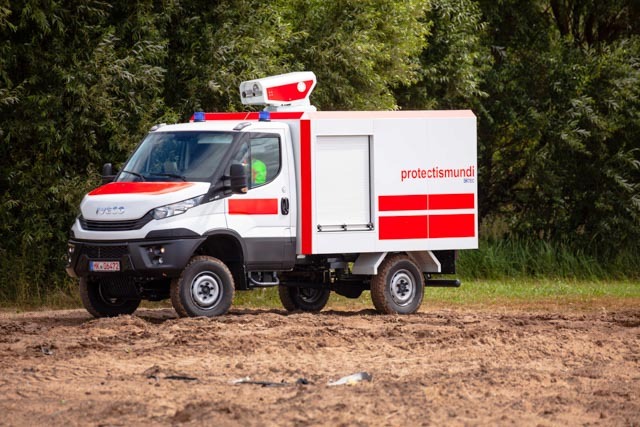 In the meantime, the protectismundi First Responder is on its way to the next deployment. 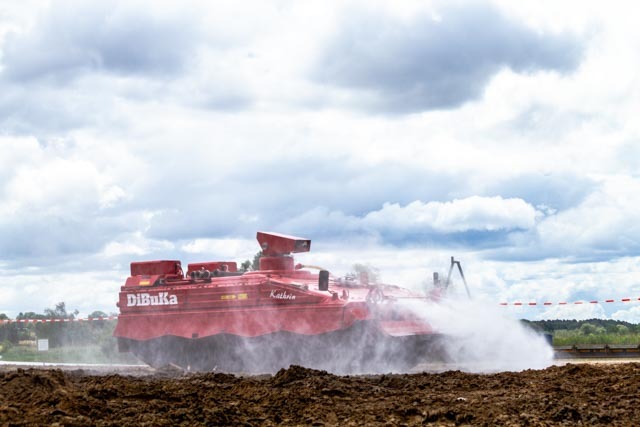 A peat field is burning. 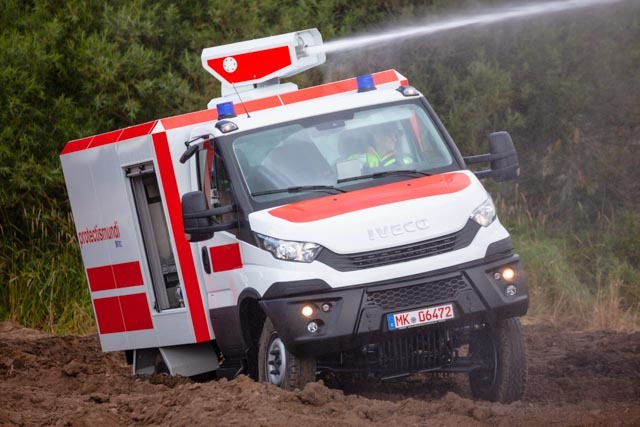 The vehicle carries more than the sophisticated technology on its roof; the cargo bay holds more German firefighting innovation: a high-tech extinguishing lance with 200 bar water pressure to combat fires successfully in extremely difficult locations – even underground – in peat ground or coal sites, making the best use of its resources. 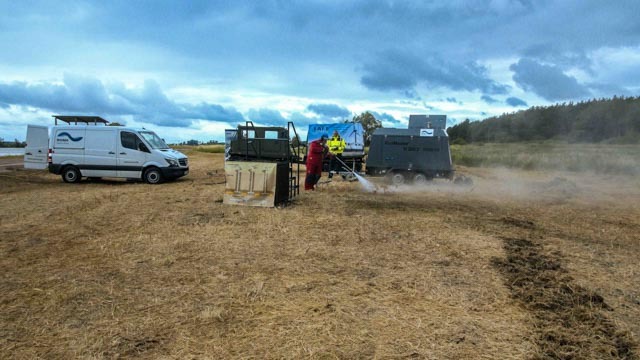 The extinguishing lance can deliver up to 700 bar through thick, burning layers of peat. 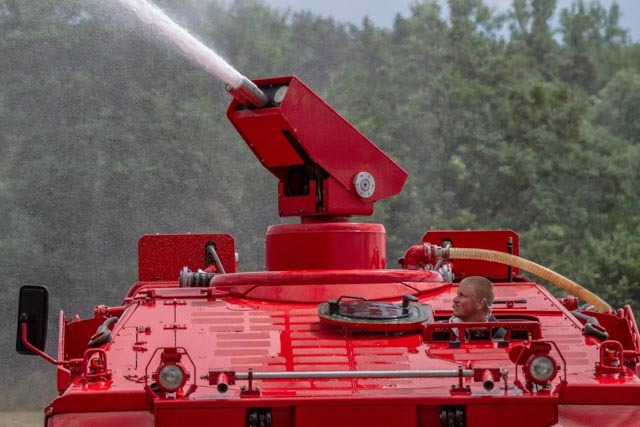 High-pressure vortex extinguishing technology can take out the fire in a radius of four to six meters around the lance along its line of travel. 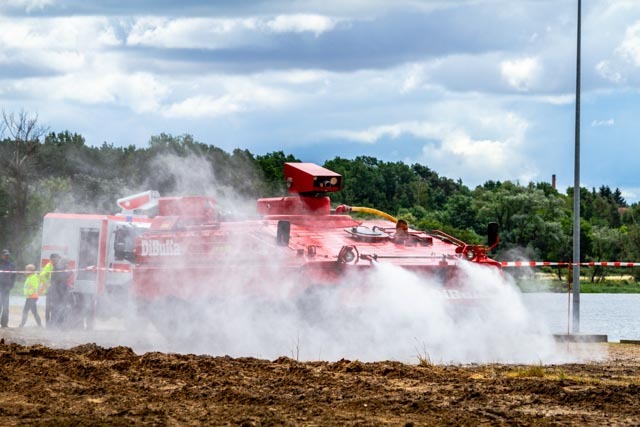 In many countries, such underground fires cause sustained harm to people, animal life and the environment with their wide, smoldering spread and high pollutant emissions. 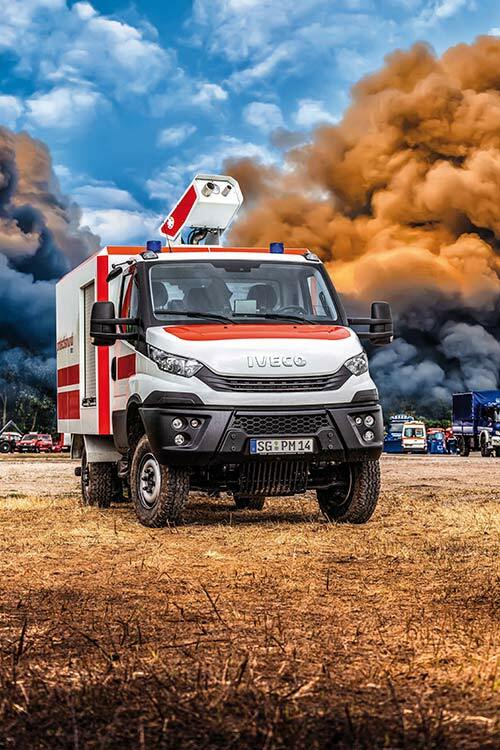 The innovative extinguishing technology from protectismundi helps reduce these risks and adverse effects and respond more effectively to catastrophic situations. 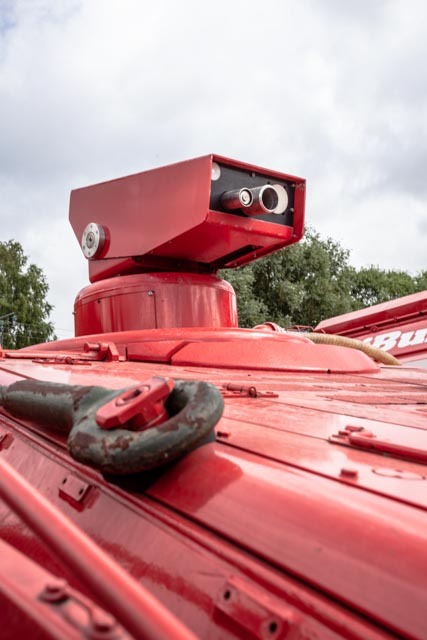 The next emergency: a burning ammunition depot! 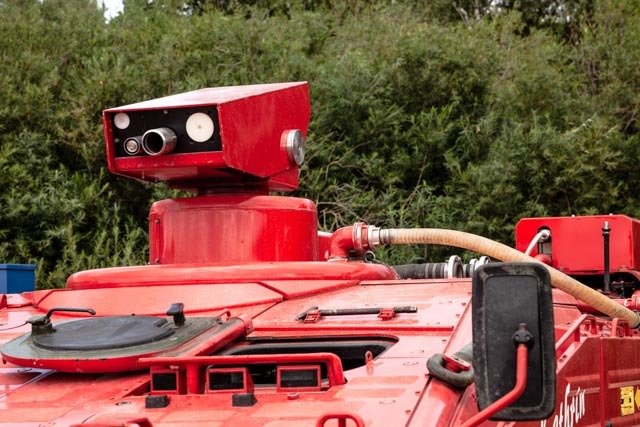 Heavy armored vehicles on tracks are deployed for this extreme situation in difficult terrain. 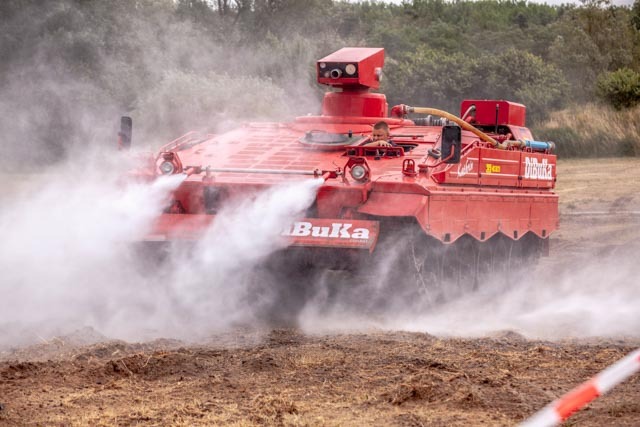 In this case, two Marder tanks adapted by DiBuKa – also equipped with the high-pressure vortex extinguishing technology from protectismundi. 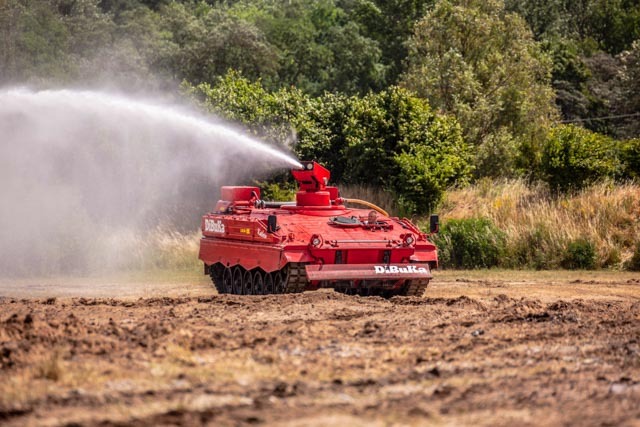 The great range of the vortexed stream of high pressure water enables the fire to be fought at a safe distance, effectively protecting the health and safety of the crew deployed. 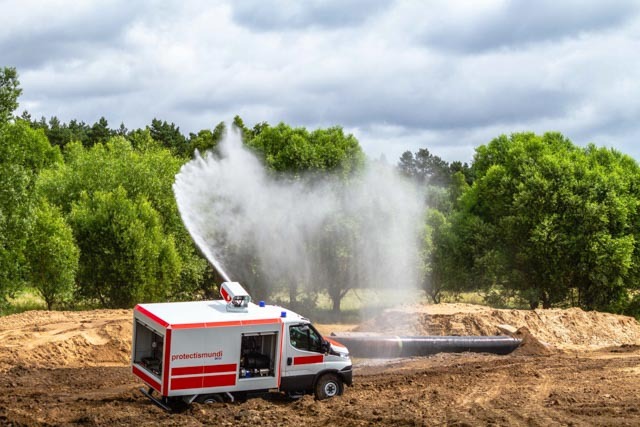 The 7000 liter water tank together with protectismundi’s innovative extinguishing technology enable significantly longer extinguishing times without resupply. Just as the ammunition depot fire is put out, another challenge for the firefighting tank and crew: a simulated fire at an oil pipeline! People must be evacuated from the danger zone. 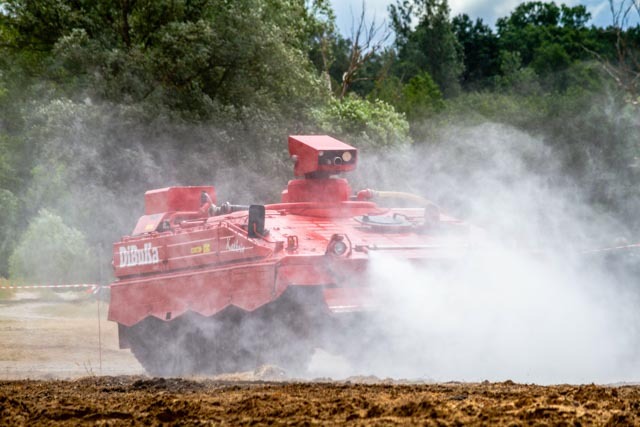 With conventional vehicles this would hardly be possible, but the adapted Marder tank, equipped with protectismundi extinguishing technology enables quick, safe rescue of lives in danger along with highly efficient firefighting in extreme situations. 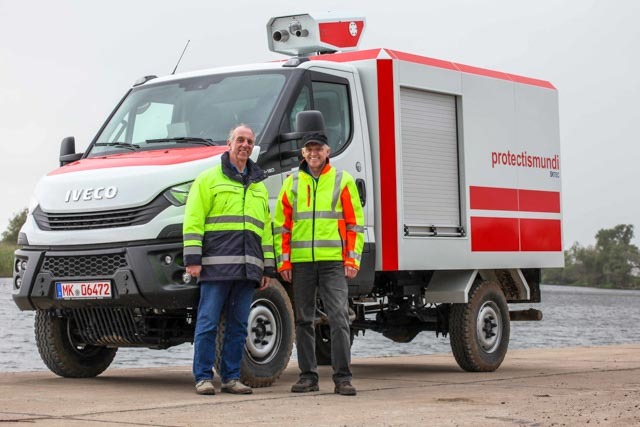 The Hägglund is the choice for special tasks of safe transport for people and material. 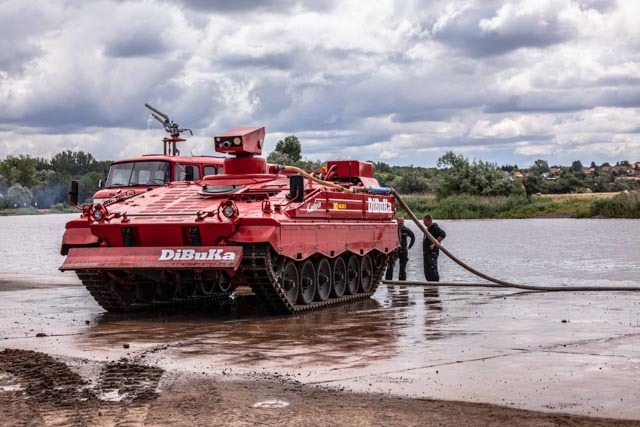 This amphibious tracked vehicle was developed for difficult terrain and refitted by our partner Dirks. 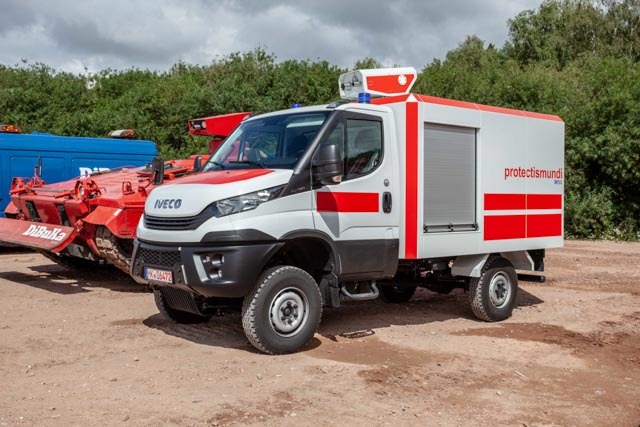 It is best equipped for the most extreme ground conditions, bogs and snow to support fire brigades, technical relief services and deployed crews. 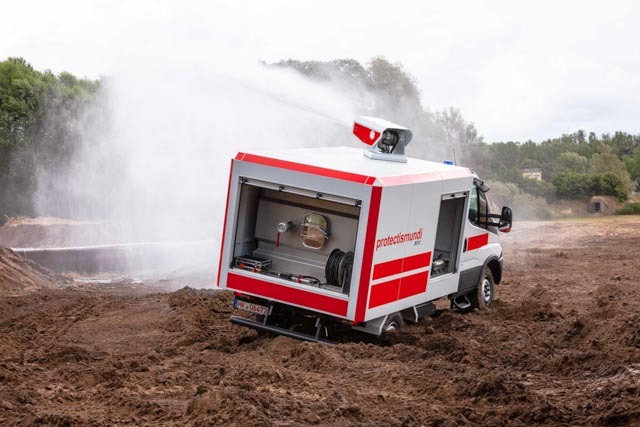 It can also be equipped – like nearly all emergency vehicles – with protectismundi’s high-pressure extinguishing technology. 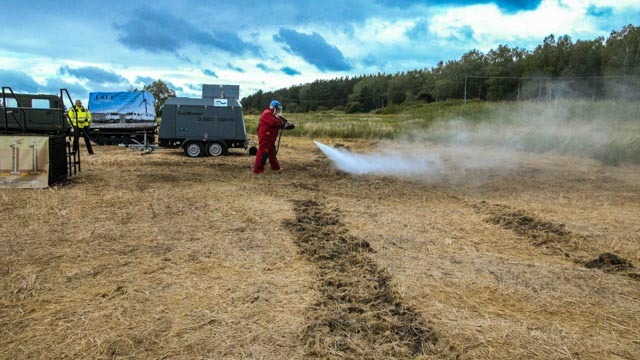 The patented high pressure vortex method far exceeds the fire extinguishing capacity of conventional equipment. 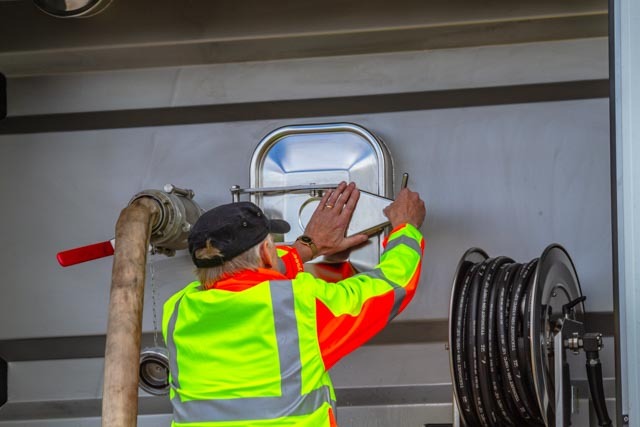 It applies extreme pressure in the spray pipe to accelerate water and create a vortex of it, which exits the nozzle in a jet of the finest droplets. 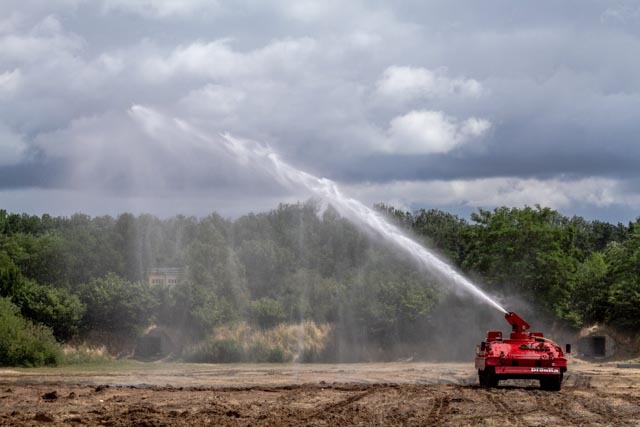 A spot jet of high kinetic energy and long range is created, at first compact and then “mushrooming” in an extinguishing plume. 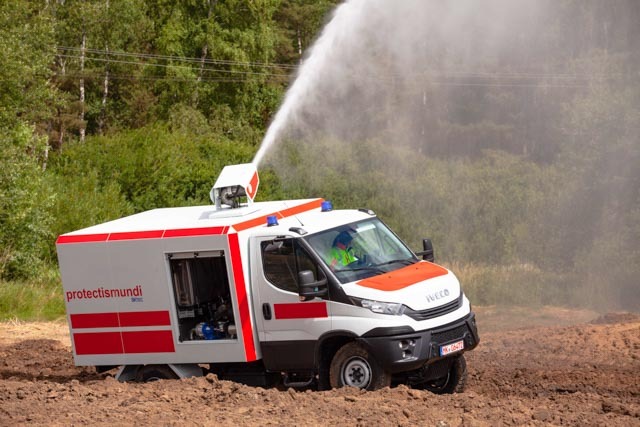 The effect on fires is magnified by the manifold increase in surface area with the droplets, while at the same time actual water consumption is greatly reduced. 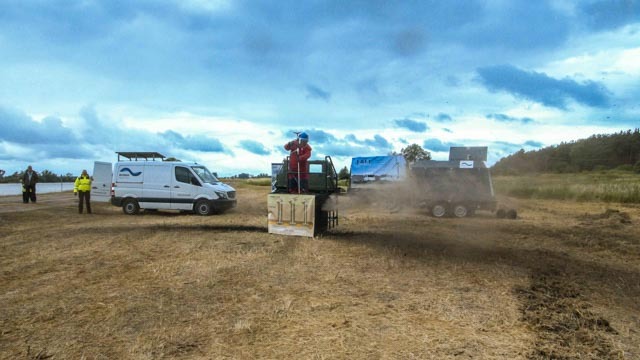 This considerably increases the time that a fire can be fought without resupplying water. 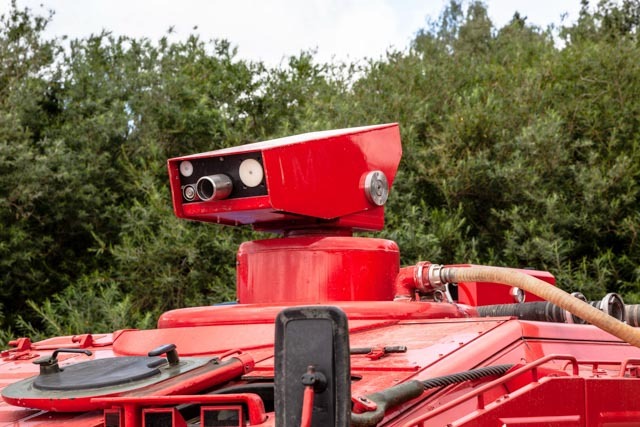 The water cannon can be controlled safely with a joystick.